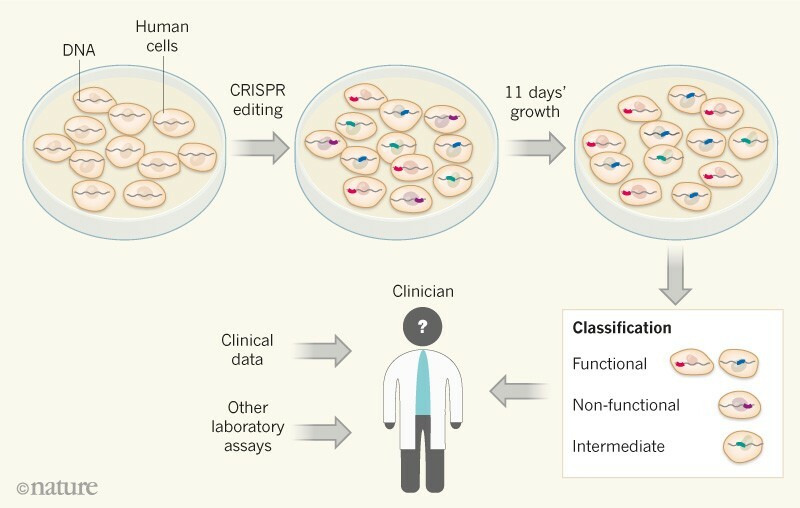 Gene editing has now been used to introduce every possible single-nucleotide mutation into key protein-coding regions in the cancer-predisposition gene BRCA1, to identify the variants that are linked to cancer risk. Stephen J. Chanock is in the Division of Cancer Epidemiology and Genetics, National Cancer Institute, National Institutes of Health, Bethesda, Maryland 20892, USA. For decades, cancer geneticists have been trying to understand which changes in the sequence of the BRCA1 gene predispose affected individuals to developing breast or ovarian cancer. Extensive efforts have focused on interpreting the plethora of genetic variants in BRCA1, using clinical observations to determine whether this or that variant warrants patient counselling about options for medical intervention1. Generally, BRCA1 variants are sorted into three categories2,3: benign variants, which cause no concern; deleterious variants, which can confer a high risk of cancer; and an unsettling intermediate known as variants of uncertain significance (VUS). Hardest to classify are variants that arise only rarely, of which there are thousands for BRCA1. Conventionally, genetic sleuthing has focused on families or populations within which certain mutations occurred at an unusually high frequency, exposing the effects of deleterious variants. But in a paper in Nature, Findlay et al.4 report an innovative laboratory-based approach to assessing the effect of thousands of variants across protein-coding regions of BRCA1. The BRCA1 protein is a key tumour suppressor, and is essential for a DNA-repair pathway called homology-directed repair. Mutations that prevent this function lead to the death of cultured human cells of a strain called HAP15. Findlay and colleagues made clever use of this property of HAP1 cells to screen for deleterious BRCA1 variants. The authors used a gene-editing approach called CRISPR–Cas9 to accurately mutate each nucleotide in 13 crucial protein-coding regions (exons) of BRCA1 into every other possible base, one nucleotide at a time — an exhaustive technique known as saturation genome editing (SGE). In each experiment, they edited 1 exon of BRCA1 in 20 million HAP1 cells simultaneously. They left the cells to grow in vitro for 11 days, then sequenced the edited exon to gauge the frequency at which each variant was present in the cell population. From these data, they designated each variant as functional (if its frequency indicated that homology-directed repair was active in cells harbouring that variant), non-functional (if the frequency was lower than average, indicating that the variant led to cell death), or intermediate (Fig. 1). Findlay et al. found that their results fit well with those obtained from a complementary assay designed to test whether homology-directed repair occurs normally in BRCA1 mutant cells, which is outlined in an accompanying paper in The American Journal of Human Genetics6. They also compared their results with an internationally recognized set of annotated BRCA1 variants7 designated as benign, deleterious or VUS on the basis of clinical data (or lack thereof, for many of the VUS). They found that their results, although not perfect, were strikingly accurate. Variants designated as non-functional in Findlay and colleagues’ analysis generally corresponded with those annotated as deleterious in the database, and, reassuringly, nearly all functional variants corresponded with those annotated as benign. The group therefore reasoned that its approach could be used to shed light on the many variants of the vexing VUS class, which keep clinicians up at night. The researchers provide evidence that some BRCA1 VUS are non-functional — a subset that should be monitored carefully in the future. Finally, they provided insights into the extent to which variants in the sequences that flank exons can disrupt protein function, thus extending our ability to interpret more pieces of the genome. The current study is remarkable for its scale, in that the method enables almost 4,000 possible BRCA1 variants to be analysed in parallel. The next study should look at regions of BRCA1 outside the 13 exons studied here, especially those that also harbour deleterious mutations and VUS. VUS are currently piling up, because the rate at which new patient sequences for BRCA1 are being collected is greatly outstripping the accumulation of clinical information needed to classify variants. Findlay and colleagues’ approach represents a potential game-changer for assessing VUS. But first, it will be crucial to collect further clinical data to validate the exciting findings of this paper. If validated, the technique could prove to be a major advance over previous efforts to study the impact of VUS in the laboratory. 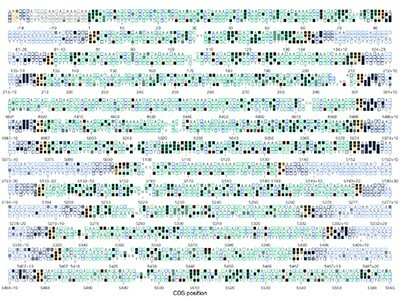 Such efforts typically combined computational models with in vitro assays of, for example, protein–protein interactions or drug sensitivity. Over the past decade, these analyses have begun to be incorporated into annotation strategies. But the pace of change has been slow, and there is considerable disagreement over the weight that should be given to this type of evidence8. The scale of Findlay and colleagues’ study, together with its apparent accuracy, bodes well for its future integration into the classification of BRCA1 variants. It is likely that the findings will be incorporated into current efforts to annotate BRCA1 variants7 that are part of the international BRCA Challenge (http://brcaexchange.org). But further thought is required to determine the best way to incorporate Findlay and colleagues’ assay into variant classification. The backbone of genetic testing is the availability of sufficient clinical data to assign risk to a given variant7,8. The new assay should supplement, not supplant, these data. It might be tempting to make immediate use of the assay to interpret VUS identified during human genetic testing, particularly because SGE has been used successfully in the past to identify targets for drug development9. But in vitro data alone should not be used as the basis for medical advice — at least until the approach has been clinically validated. Could Findlay and colleagues’ approach be applied to analyse variants in the other 20,000 or so genes in the human genome? For cancer-predisposition genes (which number well over 100)10, including the well-studied genes BRCA2 and TP53, the answer is probably yes. For these genes, non-functional variants would be expected to alter cell growth in culture, enabling a modification of Findlay and colleagues’ frequency assay to be used. The effort involved in developing such an assay for each gene is substantial, and will probably slow the immediate application of SGE for assessing VUS. But although developing these assays for all exons in cancer genes will take time and money, the dividends could be spectacular for cancer geneticists. Going forward, large SGE analyses of cancer genes should be made publicly available. It is plausible that SGE will lead to the identification of previously unknown cancer-predisposition genes that, in turn, astute clinicians will verify. Findlay and co-workers’ provocative paper should turn heads across disparate domains of genomics. It remains to be seen to what extent the authors’ approach can be applied to all of these domains, or whether it will remain an exciting development restricted mainly to cancer. Either way, this study should help researchers to realize the promise of precision medicine11. Kuchenbaecker, K. B. et al. J. Am. Med. Assoc. 317, 2402–2416 (2017). Plon, S. E. et al. Hum. Mutat. 29, 1282–1291 (2008). Richards, S. et al. Genet. Med. 17, 405–424 (2015). Findlay, G. M. et al. Nature 562, 217–222 (2018). Blomen, V. A. et al. Science 350, 1092–1096 (2015). Starita, L. M. et al. Am. J. Hum. Genet. https://doi.org/10.1016/j.ajhg.2018.07.016 (2018). Rehm, H. L. et al. N. Engl. J. Med. 372, 2235–2242 (2015). Spurdle, A. B. et al. Hum. Mutat. 33, 2–7 (2012). Ma, L. et al. Proc. Natl Acad. Sci. USA 114, 11751–11756 (2017). Rahman, N. Nature 505, 302–308 (2014). Collins, F. S. & Varmus, H. N. Engl. J. Med. 372, 793–795 (2015).